by Patrick O’Heffernan, Host Music FridayLive! Having been raised with the lush harmonies of Crosby, Stills Nash and Young, and even working with Stephen Stills for a little while, I resonate with bands that understand how to construct layered harmony vocals in earworm arrangements – songs that make you hum and sing . American Beauties is a band that does that. They happily insinuate their music into the soundtrack of your life. They’re not quite folk, not quite pop, not quite rock and not quite country; they skillfully blend all these genre’s into something that is greater than the sum of its parts. Rich guitars, gentle bass, steel pedal hints, subtle drum beats and great background vocals enable American Beauties to paint their lyrical vignettes with skill and grace. It is the kind of music you can put in your playlist to cushion the day. 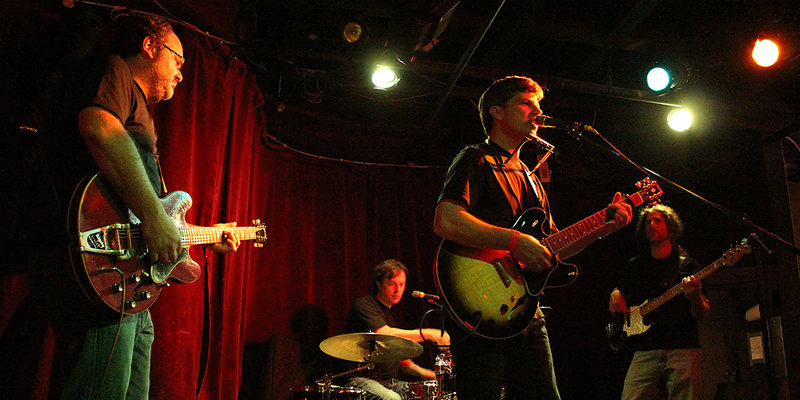 American Beauties is an indie folkrock band that emerged from the Cambridge, Massachusetts music scene a few years ago and has been playing regional clubs and festivals as its music gets college and online radio airplay and TV licensing, giving them a larger audience. The music has elements of the folkrock bands of the late 1960s and early 1970s but brings in modern sounds and themes. The band’s debut full-length album, Too Worn to Mend, showcases the skillful way these four guys and one woman (sometimes two) assemble songs that are definitely not easy listening, but easy to listen to. Too Worn to Mend is a rich album – 11 songs – recorded at Ice Station Zebra studios in Medford, Massachusetts, by Grammy award winning engineer Ducky Carlisle. Carlisle played drums and co-produced the album with songwriter and band founder Michael Gray. Carlisle’s meticulous recording and mixing shows throughout – the album has a clarity and crispness that is always a joy to find, but too often rare. The guitars are delicate, yet sing; the vocal harmonies are precise – no muddiness, no hesitation as you can hear every note right where it should be. The percussion is restrained to just the right level so that it blends an supports, not overwhelms. “Snow Blind”, the first song on the album, sets the tone nicely and lets you know what to expect – intelligent lyrical portraits gifted with country-like folkrock and resonate voices. An easy relaxed background beat with floating melodies that you can follow carefully for their detail or let wash over you while you go on about you’re your day. Either way, you know this is going to be enjoyable. The band shifts gears slightly on “Forever Like The Sea”, adding electric guitar riffs and Michael’s solo voice unfolding their first visit to New York City. The luminous, skipping-down-the-sidewalk song could be the NYC Tourist Board’s anthem, but it is real – the picture they paint is one I have seen. The harmonies are much more spare, the lines more optimistic, but the relaxed feel and rhythm remains as does the reminiscence of early groups like the Byrds or the Jayhawks. They really shifts gears on “Hole in My lung”, a serious climate change activist song. Big guitars, a quicker tempo and guitar hooks move this song along with a force difference from the easy sound of the rest of the album. It is a wakeup call in both in its message and in its musical energy. “Gone Gone” continues the energy with a song about how far away home is and solid country traveling music to carry you there. Again, the big guitars and hooks are pop and modern along with the 60’s harmonies and well-worn lines about “lonesome roads”. Other songs, like “Miles From Nowhere” and “Grace Under Fire” continue the country tempo and pedal steel, but are offset by the more serious fare of “Last Dance” and the wrap up song, a slow plead, “Mercy” – a nice range, all good. While this album has been with us for two years, it deserves a look and listen if you missed it when it came out. It’s not spectacular, but it will be one of those collections you will always keep when you rotate your playlist. It’s is just great music to listen to.